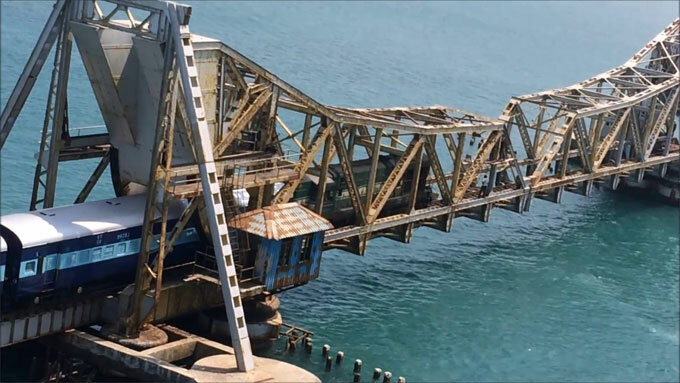 This construction video provides detailed information on Pamban Bridge. Given below, some vital points concerning the construction of the bridge. The bridge is extended up to 2,057 Km. It consists of 145 spans of 12.20 steel girder as well as one scherzer navigational rolling lift with span 225 m.
The projected construction cost of the bridge is 537.57 lakh rupees. The lengthiest span of the bridge is 289 feet (88 m). There were 600 workers who work hard to complete the construction of the bridge. The bridge is also known as cantilever scherzer rolling lift bridge. There are 143 piers in the bridge. Among 145 spans, 143 of 40 feet, one of 43 feet and another one was 44 feet span. 113 spans situate on the west side of pamban channel and 32 spans on the east side. East side is extended with two leaf scherzer rolling lift bridge. The scherzer roll and lift span are activated with the rule of spurs and gears to obtain a huge numbers of mechanical benefits. To build the entire bridge 4000 tons of cement, 136000 cubic feet of clay, 18000 cubic feet of crushed metal, 163000 cubic feet of sand and 80,000 cubic feet of boulders were utilized.